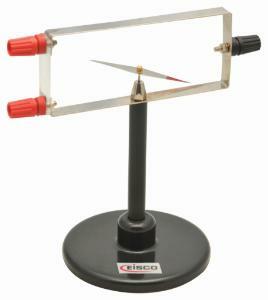 Oersted's Apparatus demonstrates the magnetic field created by a current. In other words, it shows the action of electric current on a magnet. A cobalt-steel needle (75 mm long) with agate bearing supported by a pivot is mounted on a plastic base and surrounded by a rectangular frame fitted with terminals. A power supply is required but not included.